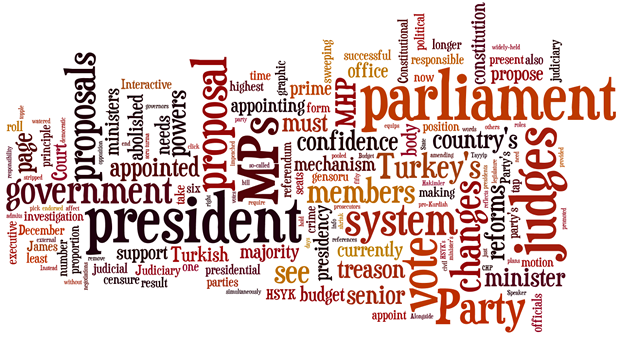 People across Turkey will vote on 16 April on proposals to abolish the role of prime minister and grant sweeping new powers to the president. This page tracks the latest polling and news ahead of that day. The James in Turkey rolling average records opinion polling ahead of the 16 April constitutional referendum and charts the change in results. The figure above is neither an opinion poll nor a prediction: it is a rolling average. It tracks Turkish opinion polls and how they have been shifting ahead of the referendum. A word of warning: the James in Turkey rolling average is not a scientific measure of Turkish voter intention. It does not balance between pro- and anti-government pollsters and it does not filter pollsters by reliability or data gathering methods. What it does do is maintain a rolling average of the last four polls published by known Turkish pollsters. It weighs this result down with the previous four polling results, which helps give an idea of the trend in support while protecting the average against extreme outlier results. As the campaign progresses, it will help give an idea of how events influence the polls.